D’Arcy Short’s T20I spot is in jeopardy after a string of stilted efforts, including a tortured innings of 28 from 34 balls last night as Australia lost by 45 runs against Pakistan. Australia will now play the world’s No.1 ranked T20I side Pakistan in the T20I tri-series final on Sunday in Harare, Zimbabwe. Today Australia face Zimbabwe in what amounts to a dead rubber, with Zimbabwe out of the running for the final after losing all three of their matches in this series so far. Last night Pakistan reminded Australia why they’re the top-ranked T20I team with a clinical display with both bat and ball. Pakistan batted first on a somewhat slow deck and were highly impressive in making an above-par score of 7-194. That fine total was built on a bludgeoning knock of 73 from 42 balls by opener Fakhar Zaman, the same man who tore out India’s heart in last year’s Champions Trophy with a scorching innings of 114 from 106 deliveries. After bowling well in the first two matches of this tri-series Australia struggled with the ball last night from the very start of the match. Pakistan got off to a flyer at 1-40 from four overs as opening bowlers Billy Stanlake and Jhye Richardson struggled to find the right length. Australia’s support bowlers had similar issues and at no point did the tourists feel truly in control with the ball. A late cameo of 37no from 18 balls by Asaf Ali tipped Pakistan over to a very good total. 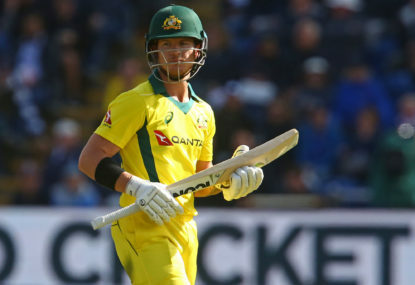 Australia’s hopes of chasing down this sizeable score once more rested on captain Aaron Finch, who has been in blazing form. Finch smashed a record-breaking 172 from 76 balls in Australia’s previous match against Zimbabwe. But last night he was undone in the fourth over for 16 by a sensational piece of bowling by Pakistan’s latest pace prodigy – 18-year-old Shaheen Afridi. The youngster troubled all of the Aussie batsmen during his spell of 3-37. When he trapped Australian wildcard Glenn Maxwell leg-before-wicket, to reduce the tourists to 3-49 after 6.5 overs, the match was almost over. Short was still battling at the other end, having a hard time timing the ball whether against pace or spin. But he has looked particularly befuddled against slow bowlers over the past month, as he was during the last IPL, where he was dropped by the Rajastan Royals after a string of failures. In Short’s four T20I innings for Australia in the past fortnight he has made 105 runs. The problem is that those runs have come at a glacial strike rate of 102, with his slow scoring tightly linked to his lack of comfort opposed to spin. The saving grace for Short is that Australia have no reserve batsmen in their squad so he may well retain his place today and for the final against Pakistan on Sunday. Australia will need to improve greatly upon yesterday’s performance if they are to win the series decider.